Lecture: "Increasing Value through Enhancing Operations"
Please reserve your spot and REGISTER for this event. 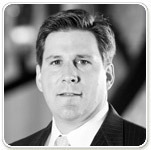 Bob Vedra is a Senior Managing Director and a Founding Principal of IOP. He has 19 years of domestic and international transaction experience, including the carve-out of corporate orphans, recapitalization of family-owned businesses, and acquisition of bankrupt companies. At IOP, he co-manages the operations of the fund, in addition to sourcing and executing transactions and managing portfolio investments. He graduated from the University of Michigan with an MBA degree with High Distinction and from the University of Notre Dame with a BBA degree with Honors. Industrial Opportunity Partners, LLC (“IOP”) is a private equity investment firm focused on acquiring and managing middle-market manufacturing and value-added distribution companies, typically with revenues between $30 million and $400 million. IOP has a particular investment focus on enhancing the operations and optimizing the cost structures of the businesses it acquires. Since its inception, IOP has raised $910 million of committed capital. For more information, visit IOP’s website.